CFE started using FreeWave radios for electric power applications more than five years ago, and their consistency, flexibility and technical support, resulted in the addition of many more radios for different applications. Today, there are more than 2,000 FreeWave radios deployed across nine CFE divisions. CFE is the only electric power utility company in México. It generates, transmits, and distributes power and energy to nearly 100 million customers and is one of the largest utility organizations in the world with approximately 100,000 employees around the country. CFE’s website notes that it incorporates more than 1 million new customers each year. Nearly 98 percent of the 100 million-plus population in Mexico uses electricity and CFE reaches close to 190,000 communities. According to the Mexican constitution, the government is responsible for the control and development of the national electric industry. CFE is responsible for meeting this requirement. It provides electric power to both low consumption customers, such as houses and offices, and high consumption users, like factories. CFE is divided into 16 different divisions throughout Mexico, which are divided by region. The company has become an early adopter of the smart grid in an effort to provide a cost-effective system to its customers. It also has been increasing its efforts on terms of budgets and well trained personnel to improve the smart grid to provide a cost-effective system to its customers. The smart grid is a complex system that can be explained by numerous definitions, examples and viewpoints. Wikipedia defines it as a digitally enabled electrical grid that gathers, distributes, and acts on information about the behavior of all participants (suppliers and consumers) in order to improve the efficiency, importance, reliability, economics and sustainability of electricity services. Another way to think of it is an intricately layered system with varying communication requirements at each layer, creating a technology backbone to ensure the grid successfully operates and reliably provides electricity to consumers despite fluctuations in peak or low usage. In any electric power network or smart grid, it is critical for a reliable communication system to ensure all components involved in the generation, transmission and distribution of energy are functioning properly and efficiently. CFE needed a vendor that could provide wireless data transmission for smart grid applications including power consumption, substation monitoring, and Supervisory Control and Data Acquisition (SCADA) applications, such as control and monitoring of power networks. In looking for a vendor to provide data transmission that would ensure the health of the entire network, CFE ran into two main problems that were common in many of its divisions throughout the country. It was experiencing difficulties overcoming long-distance communication and maintaining line of site. There also were some locations where the monitoring devices were remotely located and required dedicated repeaters to ensure proper communications throughput. Each division has its own unique barriers that make establishing communication links difficult. For example, remote locations can be composed of natural barriers, such as hills, trees, mountains, and desert, and may require long-range communication. Cities, on the other hand, have buildings as barriers and high RF noise levels that can cause difficulties with data transmission. In order to address these challenges, CFE began to look for reliable technology that would be easy to manage, yet meets its needs in terms of reliable communication over long distances and in difficult environments. Another important quality it looked for was an exceptional level of customer support offered by the vendor. CFE contacted Ampere, a FreeWave Technologies reseller partner in Mexico. After discussions with Ampere and FreeWave, CFE believed FreeWave Technologies could meet the requirements it was looking for. Today, CFE is using FreeWave’s FGR2-PE, FGR115-RC, and HTPlus wireless data radios in nine of its16 divisions throughout Mexico. FreeWave’s radios are used for Supervisory Control and Data Acquisition (SCADA) applications to monitor and control switch gears, reclosers and power meters. They also are being used in power generation and substation monitoring. FreeWave’s FGR2-PE has a second switched Ethernet port and two serial ports that allow for the transition from serial to Ethernet data communication without having to replace wireless communication hardware. It also operates in both serial and Ethernet communication modes independently and simultaneously on the same platform. The FreeWave HTPlus Ethernet radio is an industrial grade high-speed Ethernet radio that operates in harsh environments and noisy RF conditions. “FreeWave offered a solution that tackled both the distance and line of sight issues and we have achieved more consistent, reliable and modern links since implementation,” said Federico Ibarra Otero, engineer at Ampere. 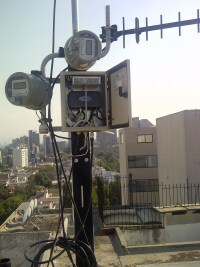 Some of the networks are installed in heavily populated cities, such as Mexico City, Monterrey and Guadalajara, where the RF noise and line of sight can potentially cause major issues with wireless communications. FreeWave’s network design and flexibility allow for the radios to achieve optimal communication, despite skyscrapers, tree coverage and high RF noise levels. In order to ensure that the radios can function in extreme weather conditions, each FreeWave radio is 100 percent tested for RF performance -- from -40° C to +75° C – which gave CFE confidence in the radios, despite weather conditions. FreeWave radios perform a variety of applications for CFE. Within the smart grid there are many types of devices connected to the main system, such as substations and the automation of these devices helps streamline the processes within the smart grid and ensure effective delivery of power. During the distribution process, for example, a substantially large percentage of power is consumed. This emphasizes the importance of having a reliable system with solid security features, accurate data and speed of data transmission. Industrially hardened wireless radios, including Frequency Hopping Spread Spectrum (FHSS) and some licensed radios, are proven to be reliable in the harshest environments and are often deployed in mission critical, industrial and life-or-death applications, for industries like government and defense. In distribution automation, there are instances when these radios can offer the most effective, economical solution, especially when compared to other options. For example, when examining fiber as an option, wireless systems tend to be easier to install. Also, the event that a buried cable is damaged and needs either repair or replacement, the costs can become very high, very fast. Some wireless systems can provide information regarding maintenance concerns and the location or type of maintenance required can easily be detected remotely. The utility operators will only need to service their remotely located assets when they are notified by alerts that are transmitted by the radios. This can save a lot of time and money. If engineered and installed correctly, wireless systems can last maintenance-free for years. Additionally, some providers offer around-the-clock support, in the event that there is an issue with the wireless network. As it looked for a solution that could tackle the distance and line-of-sight challenges, CFE had to consider that there are many communications options for the smart grid. FreeWave’s industrial radios provide enhanced capabilities for smart grid applications, such as distribution automation (DA), AMI back haul, distribution management (DMS), substation automation (SSA), load management (LM), demand response (DR), supervisory control and data acquisition (SCADA), and energy management (EMS). FreeWave also was able to overcome the communication challenges that CFE faced prior to installation. CFE started using FreeWave radios for electric power applications more than five years ago, and their consistency, flexibility and technical support, resulted in the addition of many more radios for different applications. Today, there are more than 2,000 FreeWave radios deployed across nine CFE divisions. They are a part of CFE’s smart grid and have solved many of the SCADA networks problems it was experiencing, such as the ability to create stable, long distance links. According to Villereal, FreeWave’s radios have exceeded their expectations and helped maintain a solid network, which is critical for CFE’s electric power infrastructure.